I began my content analysis, whereby I am observing online presence of well-known and aspiring bloggers. I have noted similarities between the most popular or most commonly re-blogged images and also began to question why others do not succeed in the same way. I also had a look at the hashtags used in the ‘popular’ blogs and realised that a lot of blogs will go unseen, due to the fact that they do not use this method of tagging. 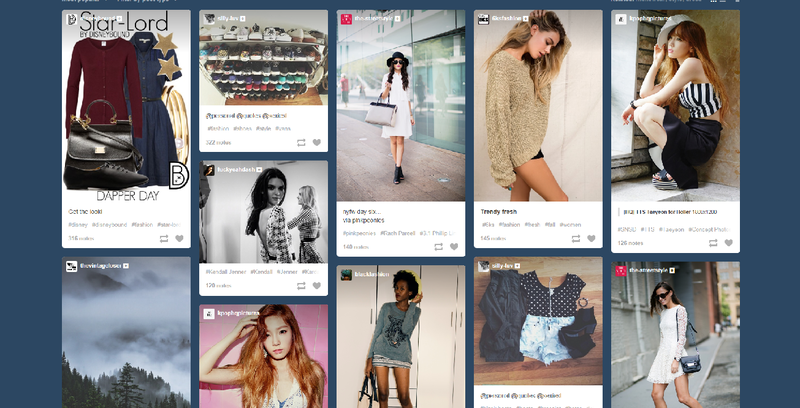 -the most immediate items which come up when searching ‘fashion’ hash-tags into tumblr, are interestingly, not images of ‘luxury’ fashion items. There is a large range of individuals who blog their own creations. These images have not got a high rate of re-blogging. I believe this is because people use Tumblr as a means for online ‘window’ shopping. Due to the vast amount and flow of the content, it is always up to date with seasonal items. Over the past few days, my Tumblr has been flooded with images of new season collections, popular images of models backstage and luxury products galore! An interesting observation was the impact of HASH-TAGGING. It is a blogger’s way to gain viewers as it provides a method for people to easily search a word or name and then they will filter through each image with the hashtag. For success on Tumblr, it is essential to hashtag, as this is how people search for images/content. When hash-tagging, general words are used, as people are more likely to find the image. It is also effective to tag the brands of the items, especially when it is a luxury item. This ensures recognition of the item and also filter’s the image to people who are searching for the brand. This week made me question why these luxury fashion items assist people in gaining such readership? What do these items represent? It is different for each individual and for each individual audience member? It is certainly clear that a lot of people who enjoy fashion, think similarly in the sense that the more expensive the item, the more desirable. But why is this? I agree that people think ‘in the sense that the more expensive the item, the more desirable.’ In my opinion, it is something that have to do with self esteem. People want to show that they have money and want to show it off. It is also to improve their public image. I know a few people who love these luxurious brand. Some of them would buy a few expensive handbags or shoes every month and post on Facebook. I’m so jealous you got to research this topic this week! I am definitely a fan of online shopping, although I don’t get to do it too much due to the fact that I’m a (cliche) poor uni student. Anyway, I think this is so interesting! I can definitely see what you mean about Tumblr being a way for people to ‘online window shop’ – although I am not a big Tumblr user myself, the times I have been on it, I use it to look at things that I like, and reblog them accordingly. It’s interesting that so many other people do the same thing! Great post, maybe you could include your own experiences with your own Tumblr reblogging history etc. to make it more personal, and in turn really fulfill the autoethnographic brief – for instance, what photos did you find yourself reblogging most? Why do you think this is? I love the topic you have chosen, and I like that you are using tumblr as the platform for your artefact. 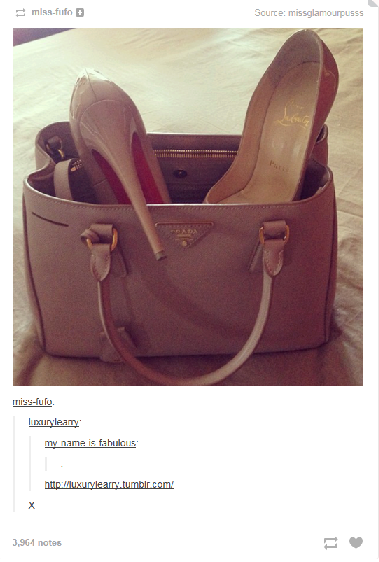 As you said tumblr is a great to reblog and like things that you find desirable,also great way to scope what is most popular with your followers, like you mentioned the luxury brands. As you said it’s also a great way to “window” shop and show your followers what you personally like. This is also a great platform as it allows you to follow popular bloggers in your field and see what they post and how people respond. Just one question, will you be using your tumblr account to express your experience or will you be using your wordpress for your auto-ethnography? I look forward to checking out your tumblr page!